Always lock the seat backrest in its upright position when the rear seat bench is occupied, or the extended cargo volume is not in use. Check for secure locking by pushing and pulling on the seat backrest. To help avoid personal injury during a collision or sudden maneuver, exercise care when transporting cargo. Failure to assure that the seat bench and seat backrests are locked into place could result in an increased chance of injury in an accident. Never place hands under seat or near any moving parts while a seat is being adjusted. For safety reasons, the rear seat bench must only be adjusted when the vehicle is stationary. The rear bench seat is split symmetrically. • fold the seat backrests forward • fold the rear bench seat back fully. ► Open the rear doors. This allows you better access to release lever 1. ► Remove the center head restraint . ► Pull catch 1 in the direction of the arrow. The corresponding rear seat backrest is not engaged. ► Fold the backrest forwards. The rear seat backrest engages audibly. 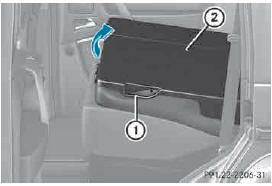 Make sure that the seat belt does not become trapped when folding the rear seat backrest back. Otherwise, it could be damaged. ► Pull release lever 1. The corresponding seat backrest is released. ► Fold backrest 2 backwards in the direction of the arrow. The seat catch engages audibly. ► Install the head restraint . ► Remove the head restraints . ► Pull short lever 2 in the direction of the arrow and hold it. 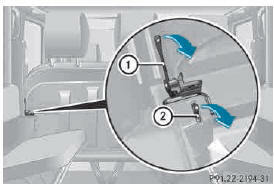 ► Pull long lever 1 in the direction of the arrow and fold the seat backrest forwards. 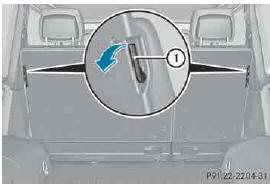 ► Fold rear seat backrest forwards. The corresponding rear bench seat is released. ► Fold rear bench seat 2 forwards. 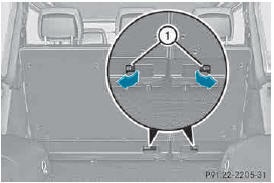 Make sure that the rear bench seat and front seat backrest are correctly engaged in position. the seat backrests or rear bench seat may fold forwards and instead of being restrained by the seats as intended you could be injured by them. Occupants could then also be injured in the event of an accident, e.g. by objects being thrown forwards from the cargo compartment. ► Fold the rear bench seat back. ► Fold the backrest backwards . ► Install the head restraints .